After breakfast spend the day with local sightseeing. Situated at the confluence of three mountain streams - Mudrapuzha, Nallathanni and Kundale, Munnar is 1600 Meter above sea level. This majestic hill station was once the summer resort of the British government in South India. 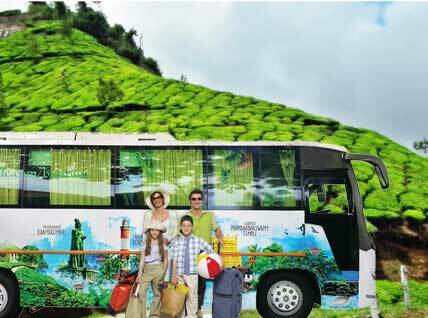 Local sightseeing of Munnar includes visit to Rose Garden, Photo Point, Honey Tree, Mattupetty Dam, Echo point, Kundale Lake. Afternoon proceed to Rajamalai were the rarest species of mountain goat, "Nilgiri Tahrs", can be spotted. Overnight stay is arranged at Munnar. After breakfast check out from the hotel and drive to Alleppey (04 Hrs). Set out on an enchanting overnight backwater cruise in traditionally decorated houseboats. Check in time is 01:00 PM and cruise starts with lunch. While cruising, let your eyes settle for the bowed-down paddy fields, local inhabitants, rustic homes, ancient churches / temples and swaying coconut groves. Food will be served on-board. Overnight stay in the houseboat. After breakfast, check out from the Hotel / houseboat and drive to Kovalam / Trivandrum (04 Hrs Drive); on arrival check-in into hotel. Kovalam is one of the prime beach destinations in India.The Kovalam beach is divided into three beaches; the Samudra beach, the Hawah beach and the Lighthouse beach. Also visit Sagarika Marine Research Aquarium not far away from Kovalam and unravel the mysteries of the marine sea. Open from 9am to 5pm charging Rs.20/- per adult and Rs.10/- per child. Enjoy the evening watching a spectacular sunset or swimming at the picturesque Kovalam Beach. Overnight is to be spent at hotel. Proceed for the sightseeing tour of Trivandrum after breakfast- Thiruvananthapuram, previously called Trivandrum, is an ancient city with tradition dating back to 1000 BC. This capital city of Kerala is a beautiful seaside metropolis built on seven hills. It is located on the west coast of India spreading over a total of 2,192 sq.km. Sightseeing tour is comprehensive with the visits to Padmanabhaswami Temple, Srichitra Art Gallery, Napier Museum and Zoo. Afternoon visit Poovar Golden Beach. Overnight stay is arranged in Kovalam.